Zinke’s new employer invests in fintech, blockchain, cyber security and energy projects. Former United States interior secretary Ryan Zinke has landed his first job since leaving the Trump administration two weeks ago. Zinke has joined investment company Artillery One as managing director, swissinfo.ch has learned. 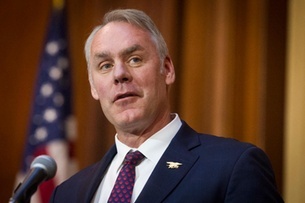 Zinke ended his nearly two-year stint as US Secretary of the Interior at the beginning of this year following criticism of his use of private jets and of his environmental record while in office. Zinke has denied accusations of cronyism and cosying up to fossil fuel companies, levelled by opposition Democrats. The former US Navy Seal’s previous business ventures include the founding of a property management and business consultancy firm. Artillery One has also signed up Swiss-based Steven Lindgren as president. Lindgren is a former chief risk officer at UBS bank who also had stints with Coutts and Credit Suisse in Switzerland. The Stanford-educated physicist also co-founded a Silicon Valley start-up before embarking on a career in finance. The US-based company invests in fintech, blockchain, cyber security and energy projects worldwide. It has been trying to buy out Swiss distributed ledger technology payments enterprise Monetas, but the proposed deal has hit a number of snags over the last 12 months. Cannon, who is in Switzerland this week to attend the Crypto Finance Conference in St Moritz, said his company is actively looking to invest in Swiss fintech and blockchain companies. Crypto Valley in canton Zug has attracted more than 400 blockchain start-ups in recent years, either home-grown on foreign companies seeking an attractive regulatory environment.